An enchanting night under the stars wedding can be achieved with a few DIY steps to light up your venue. It’s amazing how a little goes a long way to create a starry night effect at your wedding reception. Simplicity is key for a charming, elegant, and beautiful black tie event. 1) Have a tent wedding! The look and feel a tent would give your under the stars wedding is unmatched by a boxy banquet hall. This down to earth, outdoorsy venue option provides the welcoming serenity a night under the stars inspires. Not to mention, it brings your guests together for a cozier feel. What’s the most important part for a night under the stars? The stars, of course! Starry night lighting – also known as a blisslight – is an easy way to get this look. Simply aim the starry night lighting projector at the ceiling. The ceiling will be instantly transformed into a beautiful night sky, complete with thousands of slowly moving stars. 3) Every night sky needs a moon! A night sky isn’t complete without the moon. This LED Moon projector shines a realistic image of the moon and it goes perfectly with the starry night projector. Simply aim it where you want it to shine for a romantic and captivating look. 4) Give your wedding perfect mood lighting with uplighting! 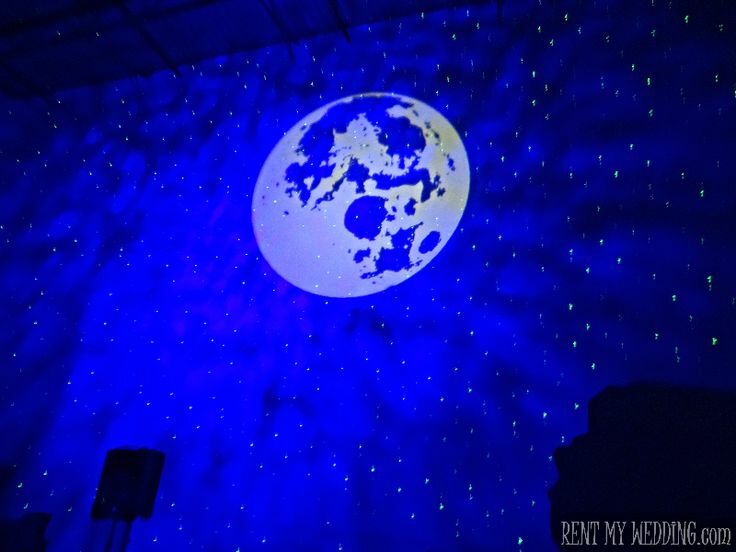 For the added effect of being under the stars, you can decorate the walls of your venue (or the drapes in your tent) with blue up lighting. Uplighting is a great and easy way to transform a room. With just a few accent lights, you can enhance the starry night theme. A look like this will really make your guests feel like they are dining and dancing under the stars. Candles add the perfect touch for a romantic candlelit dinner under the stars. We also love these centerpieces with hanging crystals! The centerpiece spotlight really makes them shine. White chair covers with blue sashes and rhinestone buckles are also a great idea for extra sparkle. 6) Add a personal touch with a monogram projector! Unlike traditional decor, gobo monogram projectors are a fantastic way to personalize your wedding with an elegant and classy look. Adding monogram lighting with your starry night lighting will not only complete the night sky look, but will also make your wedding a night to remember. You can easily put your and your fiancé’s names or a custom message in lights.